I love seeing pictures all over Pinterest of beautiful kitchens. My favorite are the light, bright, white kitchens with marble or quartz countertops that are in a light or medium gray. I'm so envious of kitchens with a crapton (again, technical term) of natural light. 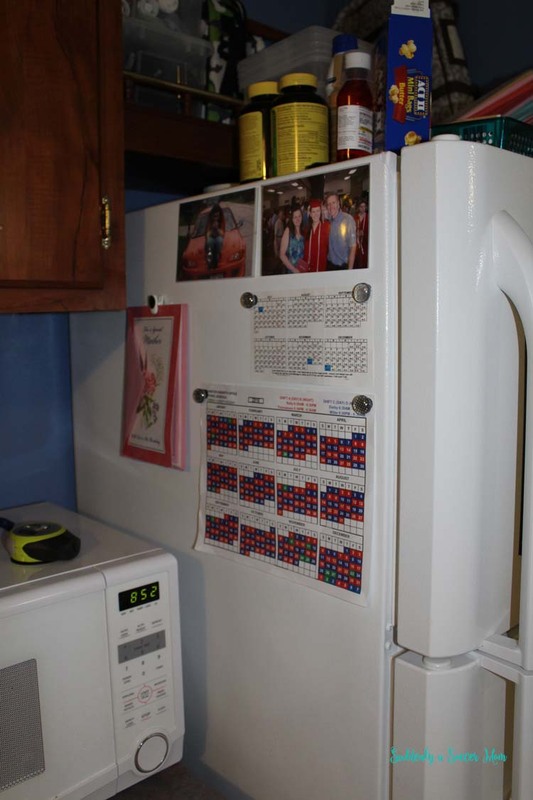 But do you know what I always notice about these kitchens? 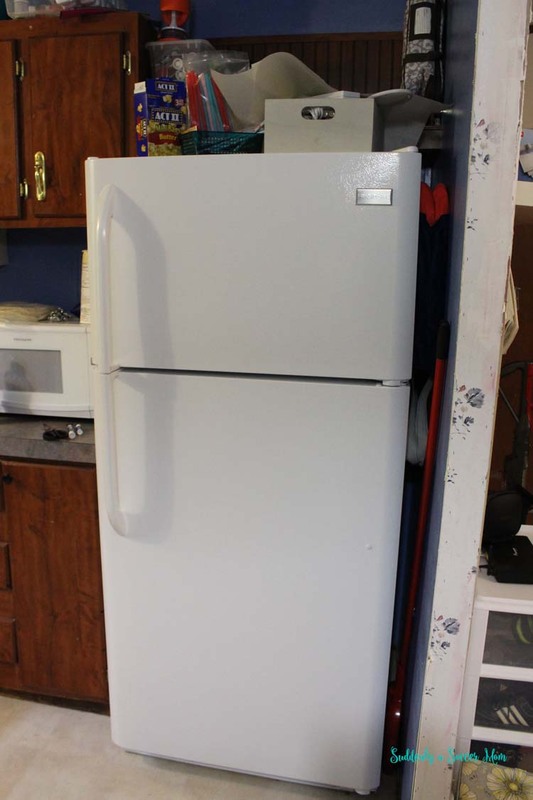 The fridge fronts are always completely bare. Not a magnet or school flier in sight. And I'm gonna be honest with y'all here...that ish don't fly in the Deputy/Soccer Mom household. 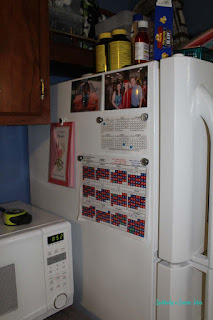 Even if we didn't get approximately 3,416,917.8 pieces of paper sent home per child on a daily basis during the school year, I still love displaying pictures and magnets on the front of the fridge. My stepsister got married in April and part of their save the date was a magnet with a photo of her and her fiancé looking absolutely amazing. I show that stuff off with pride! 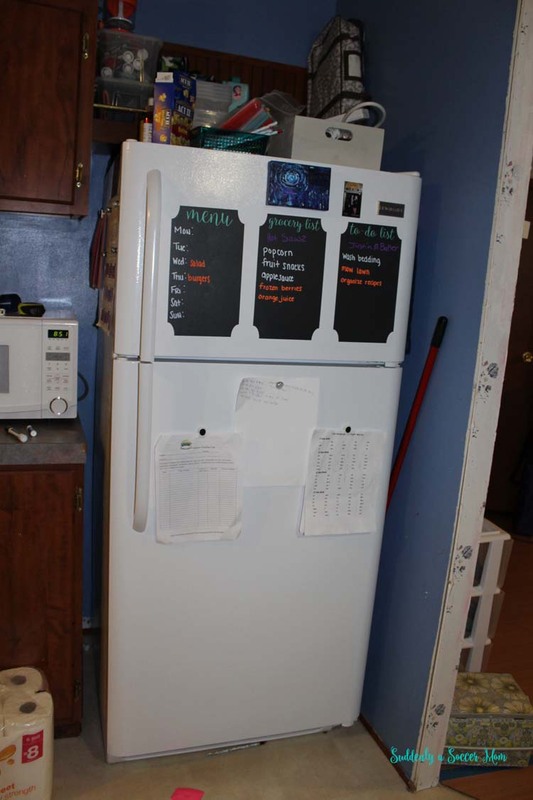 Artwork from the kiddos was starting to take over the fridge so we did come up with an alternate solution for that - which I'll share in a couple of weeks! - but a bare fridge just doesn't suit this chaotic family. 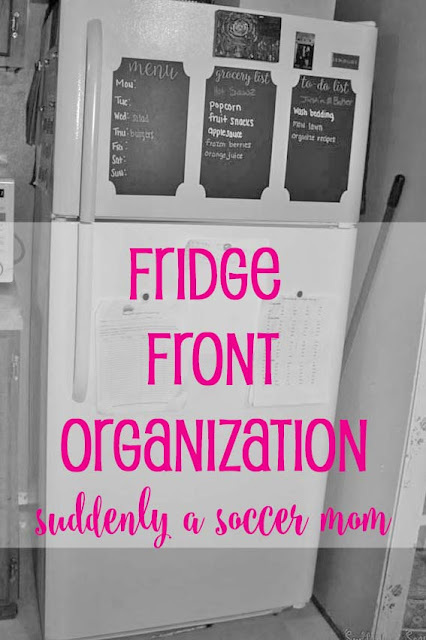 That being said, when I was poking around in the kitchen the other day, I realized that our fridge was a little (okay, a lot) too jam-packed, even for our clutter-accepting style. The freezer section is so super cluttered! Deputy Dad's work schedule always stays hanging for quick reference. As does his mom's, since we go spend lots of time with MawMaw when we have the kids, and we have been known to call of her for babysitting every once in awhile. 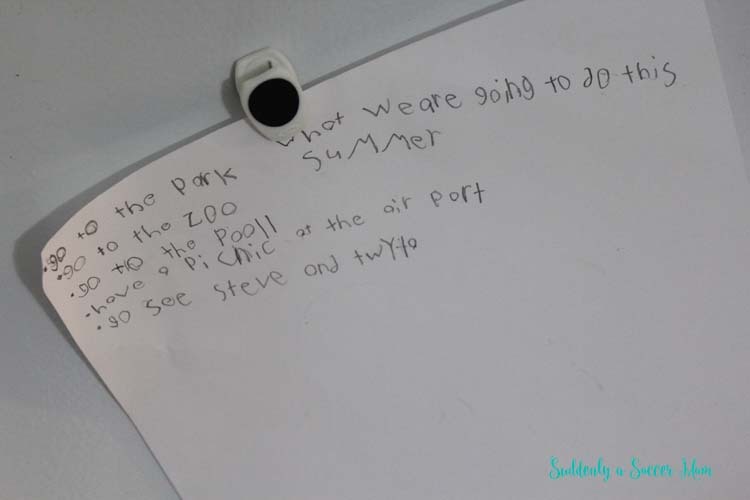 Our summer to-do list, as written by D, also hangs on the fridge. I'm pretty proud of us. We're only halfway through the summer, and we've already gone to the "pooll", had a picnic at the airport, and gone to see Steve and Twyla, who are my parents that we just got back from visiting in Wisconsin. Looking at what we had on the fridge, that's actually mostly what we had on there. It's just that everything was so disorganized it was hard to tell what was what. So we figured it would be best for everything to have a "zone". Our first step was to completely clean off the fridge. 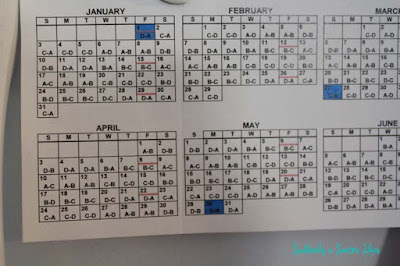 Once we had it cleaned off I could see the dry erase marker outline from our old weekly menu that never stayed put, and also the smudges from around where we had another dry erase marker used during our brief attempt at trying a cleaning calendar. Spoiler alert: totally didn't work for us. Since I had everything off already, I took a Magic Eraser to the dry erase rings and the random spot of blue GoGurt I found on the door. Thanks, kiddos. 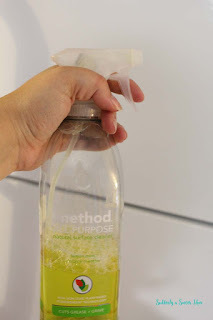 Then I sprayed everything down with this Method cleaner that I swear by. I'm in love with the scent of this stuff, and it cleans so well!! 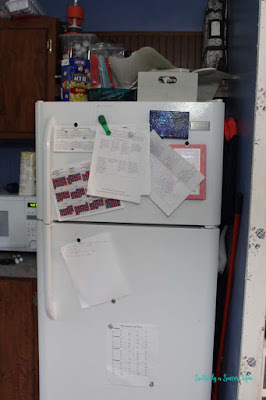 Once everything was back to sparkling clean, I measured out the free space I had on the freezer door, since that's where we decided we wanted our menu, grocery list, and to-do list to go. 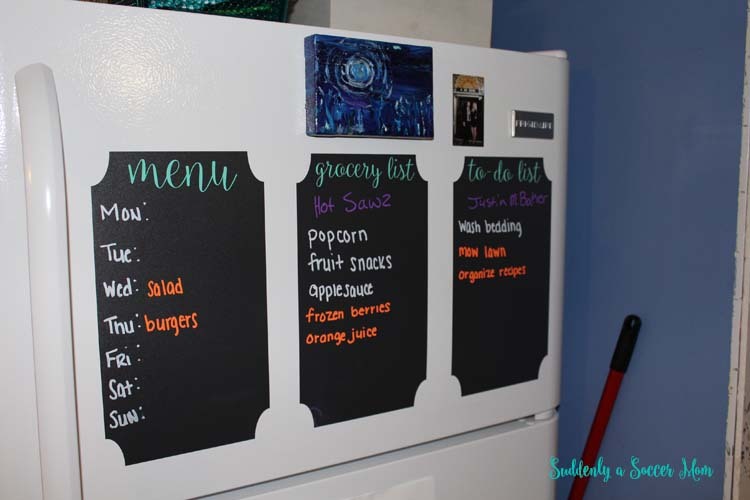 Since we had already tried laminating paper and using a dry erase marker and I didn't like the stains it left behind, I decided to go with chalkboard vinyl this time. 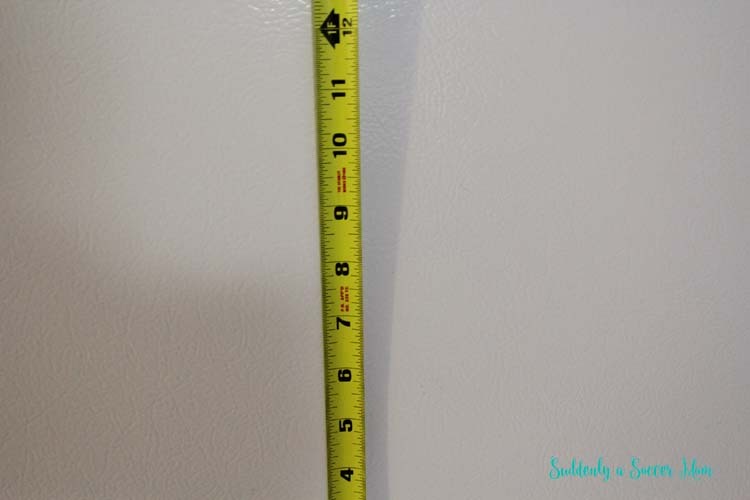 I obviously didn't want anything getting in the way of the freezer handle, and the fridge logo badge took up some free space as well, so I kept my measurement below that. This gave me about 26" of width and 14.5" of height to work with for my list area. I knew I needed three lists, and I wanted some space between the lists to break them up a little bit, so I decided to make each list about 7" wide and 12" high. 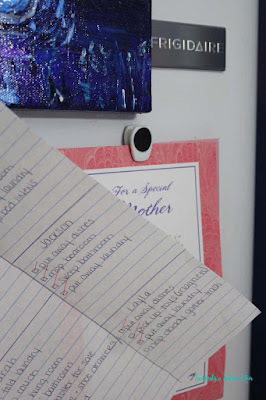 I used my Silhouette Cameo 2 to make the actual lists. I'll do a tutorial on that next week, just because this post is already super long and if I add a tutorial to it y'all will be reading for 30,000 years, and ain't nobody got time for that. Side note: Deputy Dad showed me that video for the first time ever. I'm not going to lie. It made me giggle. Because really. Who does have time for bronchitis?? 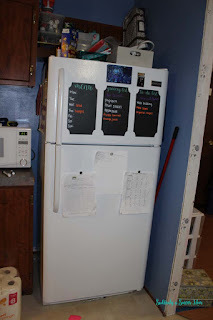 Anyway, once I got my chalkboard vinyl lists cut I enlisted Deputy Dad's help to put them on the fridge. This was the most annoying part of the entire project. 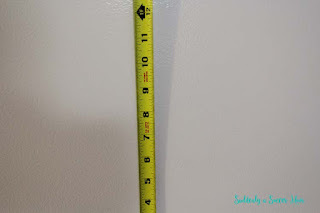 I learned during this project that our fridge doesn't sit level, so rather than just use my handy-dandy laser level I had to use a measuring tape and painter's tape and all that jazz. I'm terrible at straight lines, so this part of the project I really was better off just handing it over to Deputy Dad and "supervising" from the comfort of the couch. Hooray for awesome husbands who have mastered the art of the straight line. I also hung this little magnet painting I got when I was visiting aforementioned stepsister in Minnesota a couple of years back. I'm completely obsessed with it, and it's gone with my to three different houses now. I wish I had bought a larger piece by this same artist. The magnet of her is up here, too. 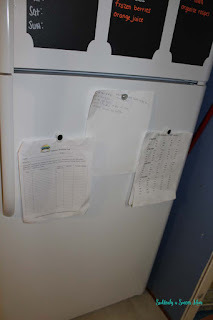 Once we had the lists up, we dedicated the fridge section of the door to the kids' school paperwork. D and J are the only two kids in school right now, so D's school paperwork goes on the left and J's goes on the right. They have a book project and reading log they need to complete over the summer, so that's what you see hanging there now. The first month of summer vacation we've been pretty lax in keeping up with their reading logs, so we really need to get cracking on that. #naughtyparents We hung the summer to-do list up there, too. 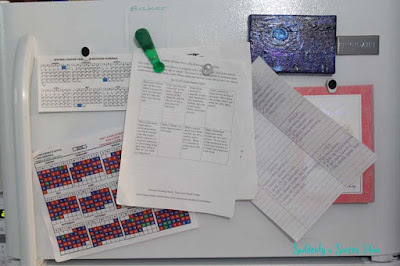 For the important papers we need to deal with, we're planning on getting a letter sorter that is magnetic to put on the side of the fridge. That way it's out of the way, but still easy to access so we remember that there are papers that we need to deal with. 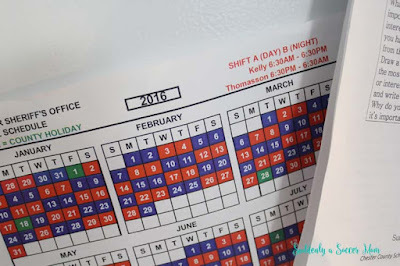 The work schedules we have hang over here, too. 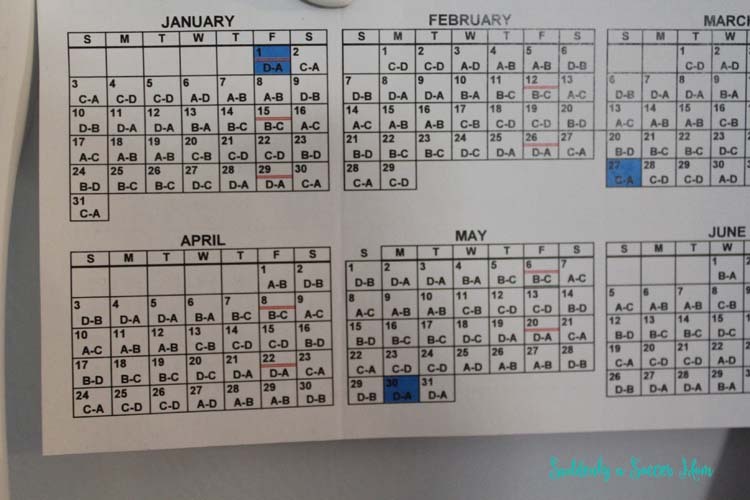 We'll obviously have to tweak this system a bit in fall of 2017 when Baby Girl goes to 4K (I'm not ready for that!) but that's far enough off that I'm comfortable leaving this system in place for a good long while. Plus, the colored chalk markers make me smile every time, and I love the reversible tip. 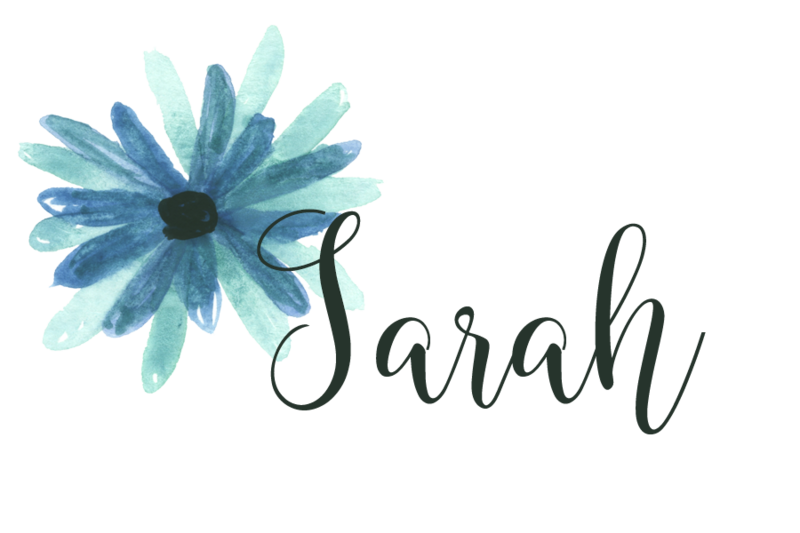 Krazy Coupon Lady posted them awhile back because they were on some crazy good deal (see what I did there?) and I scooped them up because I knew they'd get used around here eventually. So what do you think?? Are you pro-clean fridge or do you use the fridge front as another command center for your home? What method do you use to keep your paperwork under control? Please share! I'm always on the lookout for more efficient ways to manage the paper that comes through these doors.